The DreamLine Aqua Fold is a Bi-Fold shower or tub screen with a modern design and a European flair. The Aqua Fold features a trackless style and a continuous self-centering pivot to add style and create an open, inviting shower space. The DreamLine Aqua Fold model will transform your bathroom with charm and style to match its functionality. The DreamLine Linea collection of walk-in shower panels is a welcome addition to any contemporary bathroom. The Linea is elegant and functional, giving the entire shower space a sense of high-end luxury with a modern appeal. 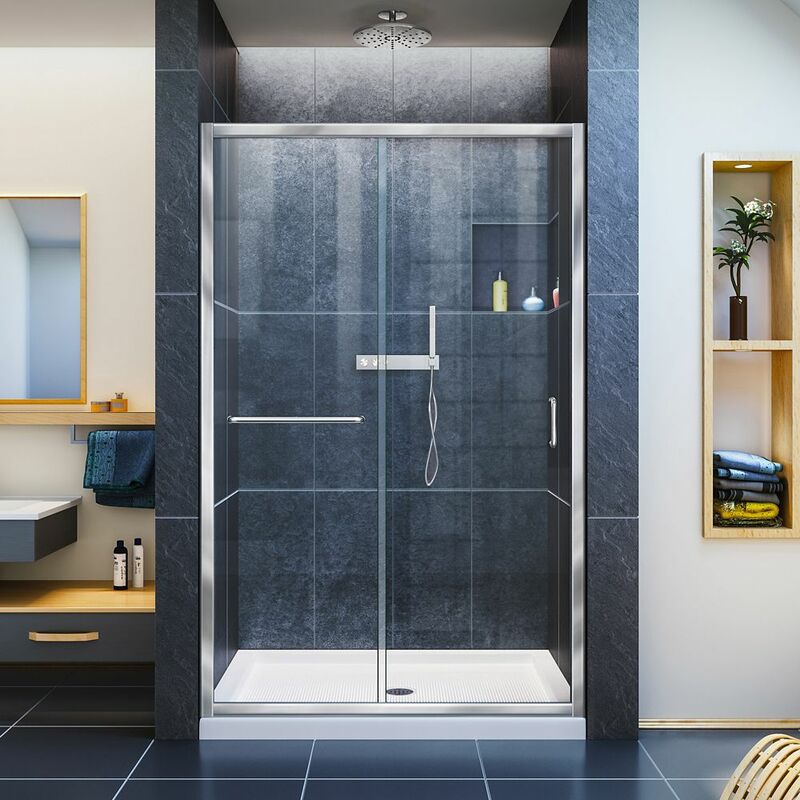 Expand the possibility for efficient use of space with the bright and open design of a doorless shower. DreamLine exclusive ClearMax water repellant and stain resistant glass coating adds superior protection from stains and is nearly maintenance-free. Choose Dreamline for the ultimate solution to your shower project! Infinity-Z 44-inch to 48-inch x 72-inch Semi-Framed Sliding Shower Door in Chrome is rated 4.4 out of 5 by 42. Rated 5 out of 5 by Tony from Really good fabrication easy to install and overall looks so... Really good fabrication easy to install and overall looks so nice . Instructions are really good to fallow and brings extra parts .. Rated 5 out of 5 by Chief from Had a contractor install it for me. Said I got... Had a contractor install it for me. Said I got a great deal. Rated 5 out of 5 by RonnieD from Great addition to our bathroom! We just moved into a new house that had a shower enclosure in a small bathroom that used a shower curtain. I installed these shower doors and what a difference it made to the look of the room! I was leary of the quality, since I purchased them sight unseen at Lowes, since they were on sale. The reviews on this site looked great, so I took a chance and am very glad I did! As other reviewers have mentioned, the directions could use a little clarity. I would HIGHLY recommend reading the directions several times before attempting to install the doors to make sure you are clear on what they say. I downloaded them from the site so I could read them before my doors came in. I am a woman in my late 50's and thought they were relatively easy to install, you just need to take your time and measure twice before cutting. Make sure you have a good saw to cut the track if needed. I was able to do most of the track work myself and just needed an extra pair of hands when moving the glass doors around. I wished I had looked at the website to see what the frosted glass looked like before I went to Lowes to order them. They did not have this model on the floor and no examples of what the frosted glass looked like. (I did not realize it was an option till speaking with someone in the bath section. After re-checking the site after my purchase, I probably would have gone with the frosted glass. The doors seem to be great quality and I appreciated the fact that when I opened the box to make sure all the hardware is there, they have a second level of quality control where someone who inspected the box signs off that the hardware is there. PLUS, they give you a second pack of extras just in case something happens. Will wait a bit to see how they hold up and then get another set for the tub in the main bathroom. Rated 5 out of 5 by CCB1 from Beautiful high end hotel look I bought this product 4 years ago. It’s looks like a spa. Rated 3 out of 5 by HomeDepotCustomer from Good enough for the price. ... Good enough for the price. Rated 5 out of 5 by John BF from Great shower door I bought this shower door to install in a new bath-to-shower conversion. It was fairly easy to install and looks amazing.